This week's tablehopper: Sunday forecast says aperitivo. SF AMATRICE image and website design courtesy of Bureau Jules. Ciao amici! As you probably know, I’m crazy busy promoting and planning our big fundraiser this Sunday September 25th, SF AMATRICE, which is now at ~54 MINT~. We are going to be taking over their beautiful patio, Americano in hand. Can’t you just see yourself there? I do! 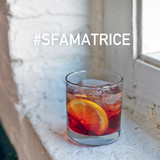 Our all-day fundraiser has a stellar lineup of SF restaurants, local businesses, importers, purveyors, and suppliers, all coming together to raise funds for Italy earthquake relief in Amatrice. It will be quite a spread of antipasti, pinsas, cheese and salumi, dolci, Negronis and Aperol spritzes from Campari America and Rye on the Road, fantastic wine, and Peroni beer too. And, of course, there will be pasta all’amatriciana! Imagine yourself at your dream Italian bar for two hours, eating and drinking your favorite Italian dishes, all to your heart’s content. You’d totally spend more than $75 on a spread like this! And there’s no tax and tip to worry about. We are selling tickets in two-hour time blocks, making it easy for you to swing by, no matter what you have going on. I’ll be there all day! It would be great to see you before I leave for New York for the month of October. You can read more here, but here’s where I really need your help. Can you please buy a ticket now? GRAZIE! We need to sell this out! We will be donating 100 percent of the funds to the Comune of Amatrice! Can’t make it? You can also donate on the ticket page. Anything helps. Truly. Can you share the event on Facebook (please click “interested,” or even better, “going”!) and Twitter (please RT!) and like and share on Instagram? Can you print out this flyer and display it in your shop, restaurant, or place of work? Yes, please! You rock. Thank you. Grazie mille! Anything and everything helps! See you Sunday Sunday Sunday! Tutti a 54 Mint! #SFAMATRICE Is This Sunday, and It's Going to Be Sunny! Imagine yourself on this patio on what is going to be a SUNday, Negroni in hand. Photo: © tablehopper.com. Did you see the weather forecast for this Sunday September 25th, the day of our SF AMATRICE event? No? It says APERITIVO WEATHER, people. That’s right, it’s going to be 81 degrees as we’re on the ~54 MINT~ patio drinking Aperol spritzes, Americanos, and Negronis courtesy of Campari America and Rye on the Road. The turnout of donors has been incredible, but what we need is a turnout of ticket BUYERS. That’s why I’m talking to YOU. I know, $75 isn’t cheap, but this is a fundraiser, with 100 percent of proceeds being donated to the Comune of Amatrice to help them rebuild after the horrific Central Italy earthquake, which completely leveled their city. Can you imagine? Yes, we can. Which is why we want to sell this event OUT! Let’s break this down, shall we? For $75, you have two hours of unlimited Italian cocktails from Campari America, more beautiful wines than you’ll know what to do with, and Peroni beer, plus coffee from Caffè Umbria. If you were at a bar, drinking and hanging out for two hours, that would easily be $65, before tax and tip. And then we’re adding in antipasti, cheeses, salumi, pasta, pinsas, dolci, and even ice cream from Humphry Slocombe—yeah, it’s quite a spread! Abbondanza! See, you get a lot for $75. I know, it makes you want to buy some tickets, doesn’t it? We also wanted to make this easy to swing by, even if you already have plans that day. The event runs all day from 12pm-8pm, and since we’re selling tickets in two-hour time blocks (12pm-2pm, 2pm-4pm, 4pm-6pm, 6pm-8pm), you can take your pick. There will be different restaurants serving at each time slot, so you don’t have to worry about food running out! Here are even more precious restaurant donors taking part: 54 Mint Il Forno, Acquerello, Palio d’Asti, Piccino, Rose Pistola, and Zero Zero, and partners Bi-Rite Market, Cheese Plus, Emporio Rulli, and Josey Baker Bread! Pasta is being donated by Rustichella d’Abruzzo and Manicaretti, plus cases of tomatoes and cheese from Casa de Case (and a leg of prosciutto!) and Lettieri & Co. The generous vino donations from Casale del Giglio, Cherio, Fiorella, Folio Fine Wine Partners, Full Circle Wine Solutions, Scuola di Vino, Siena Imports, and Uva Enoteca are fantastico! Even if you can’t attend, please consider a donation! Or please, just spread the word! Every post counts! (Here’s the event on Facebook to share.) Can you print out this flyer and display it in your shop, restaurant, or place of work? Everyone is donating their time, products, and labor for this event in order for us to be able to donate 100 percent of the ticket price to earthquake relief! Grazie, tutti! We look forward to seeing you. PLEASE help spread the word. Post/share on Facebook, tweet/RT, like and repost on Instagram, email your friends. Any help with donations (Italian food, products, a barista to help with coffee, extra hands to help serve and clean, promotion) is so very appreciated! Contact Marcia of tablehopper! Baci! See you there! And don’t forget, spread the word! I look forward to hugging you on Sunday! Guests must be 21 and over. Invitation is nontransferable. After running our little teaser about ~THE ELITE CAFÉ~ reopening very soon, it ends up that they are targeting October 3rd for the opening. To recap, Andrew Chun of Schroeder’s (Sidecar Hospitality) took over the 35-year-old restaurant space earlier this year. The chef is Sidecar’s executive chef and NOLA native, Chris Borges. He’s going to stay true to the place’s New Orleans roots, with dishes like duck gumbo and crawfish étouffée (available in two sizes), and of course oysters on the half shell, with seasonal Gulf oysters. The famous Meetinghouse biscuits will remain on the menu (I heard from their creator, Joanna Karlinsky, that she was over there teaching the team how to make them). You can get them with jam, and there will be biscuit sandwiches featuring fried chicken, ham hocks, and blackened catfish (two for $12). Some salads, include a kale salad with smoked onions, figs, and pecans dressed with a satsuma vinaigrette, and a muffuletta chopped salad with Little Gems. Brunch will be served, starting at 9am on the weekend, with New Orleans eggs rancheros and bananas Foster French toast. Bar director Kevin Diedrich (Pacific Cocktail Haven/P.C.H) has added a frozen drink machine for frozen Irish coffees, and his version of a Sazerac, Hurricane, and other spins on classics. Beverage director Mauro Cirilli (Press Club) will oversee the wine list. The interior got a refresh from BCV, but the mahogany booths and crown molding from the place’s 1928 origins are still there to be honored, so don’t worry. There’s a new bar top and booth tabletops crafted from Carrara marble, and there are three brass-topped communal tables now too. There’s also a 70-inch television for big games, but otherwise it’s hiding behind a mirror when not in use. I’ll keep you posted on more as the opening arrives. 2049 Fillmore St. at California, 415-346-8400. 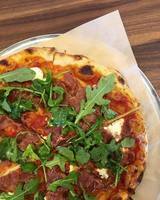 At Waxman’s Pizzeria: prosciutto, ricotta, balsamic, arugula pizza. Photo via Facebook. The counter at the newly open Scullery. Yelp photo by Jason L.
Some openings around town include ~WAXMAN’S PIZZERIA~, which opened next to Waxman’s restaurant in Ghirardelli Square. The menu includes some fried apps and some main dish salads. There are also sandwiches like the JW chicken salad sandwich (which includes Jonathan Waxman’s famous chicken), a meatball sandwich, and some appetizing pizzas, like chicken, corn, cherry tomato, Fontina; shrimp, Grana, salsa verde, chile; and Nueske’s bacon, potato, Grana, aioli. There’s also a kid’s menu and wine for mommy. Plus, a patio. Open Tue-Sat 12pm-9pm, and Sun 12pm-5pm. 900 North Point St., Ste B-201B, at Polk, 415-226-1244. 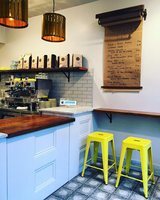 A cute, new, and little coffee shop has opened up in the Tenderloin, ~SCULLERY~, featuring coffee from Sightglass, plus cold brew and nitro coffee, toast from The Midwife and the Baker (topped with avocado, or cream cheese, or spicy PB&J, or Welsh rarebit with McQuade’s chutney), and some pastry goodies from Jane, like a sausage croissant. Menu here. Open Mon-Fri 7am-5pm, Sat-Sun 8am-5pm. 687 Geary St. at Leavenworth, 415-440-4497. ~CHERIMOYA 2~, a Vietnamese café, is open in the Sunset, serving banh mi, spring rolls, garlic noodles, bowls, and more. The original is in Burlingame. Open Wed-Mon 11am-7pm. 2110 Irving St. at 22nd Ave. 415-650-3009. There’s a new Korean spot in the Excelsior/Mission Terrace, ~HWARO~, with a playful menu like Korean quesadillas and hangover soup, along with some classics (jap chae, seafood pancake). Open for lunch Mon-Fri 11am-2pm, dinner 5pm-10pm, Sat 4pm-10pm, and Sun 4pm-9pm.4516 Mission St. at Harrington, 415-859-7111. A kamayan feast at Pampalasa. Photo via Pampalasa. For those who like to think about their food and drink, you won’t want to miss this next installment of La Cocina’s F&B: Voices From the Kitchen, which is all about Brains. 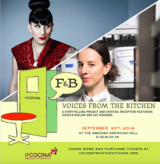 The storytelling event includes Jessica Koslow of LA’s Sqirl, Kat Kinsman (senior food and drinks editor at Extra Crispy and founder of Chefs with Issues), Barb Stuckey (president and chief innovation officer at Mattson), and many other brainy folks. It all happens on Friday September 30th at Swedish American Hall. Check out the full lineup, get your ticket ($45), and see you there! There will be cocktails, making this a no-brainer. 6pm-8:30pm. 2174 Market St. at Sanchez. The unique designs are all printed on quality cotton t-shirts (thanks to our local pals at Poppy Promos) that have a nice fit for both men and women—and did we mention they are super-soft? Tees are $25, and the Blue Fox hoodie is $45 (it’s really plush). Order online right here. Lookin’ good, you! The view from the new Cityscape. Photo courtesy of Hilton San Francisco. Some exciting news for Almanac Beer Co. They’ve found a space for their taproom: the former Sous Beurre Kitchen on 24th Street. The SF craft brewer will be calling it ~ALMANAC SAN FRANCISCO~, which will serve all their beers (on tap, in the bottle, and in growlers). And they’re trying to convert the back area into a beer garden. Scoop reports there will be 72 seats, with a full kitchen serving “beer-friendly food” (they’re on the hunt for a chef). Stand by for updates. 2704 24th St. at Potrero. Also in the Mission: Lazy Bear’s David Barzelay is taking over the about-to-close The Tradesman and has plans to open a ” cocktail-focused restaurant” with bar manager Nicolas Torres. Look for a more affordable menu to go with the seasonal cocktails and a more laid-back format (read: not a formal sit-down dinner). Eater says the target is early 2017 for the opening. 753 Alabama St. at 20th St.
Next time you want to show off one of our gorg city views to Aunt Edie visiting from Missouri, or maybe you’d just like to enjoy it yourself, Hilton San Francisco Union Square has just opened ~CITYSCAPE SAN FRANCISCO LOUNGE~ on the hotel’s 46th floor, boasting 360-degree panoramic views from 14-foot floor-to-ceiling windows. There are cocktails, small plates and appetizers, wines by the glass, and a variety of beers on tap. The viewing lounge is open 5pm-12am nightly. 333 O’Farrell St. at Taylor, 415-771-1400. Folks who enjoy grabbing a glass of wine at SoMa’s ~DISTRICT~ will now find full liquor and bar service, with a focus on whiskey (like 60 small-batch bourbons, Scotches, and ryes) and a list of whiskey cocktails to go with their small plates. 216 Townsend St. at 3rd St., 415-896-2120.